Build parking spaces and they will come—in cars. New research presented this week at the annual meeting of the Transportation Research Board finds a direct, causal relationship between the amount of parking in cities and car commuting rates. University of Wisconsin researcher Chris McCahill and his team examined nine “medium-sized” cities with relatively stable populations between 100,000 and 300,000. They compared historical parking data with car commuting rates beginning in 1960, finding “a clear, consistent association” between parking levels and car commuting that has “grown stronger” over time. Using an epidemiological research method, McCahill’s team determined that the relationship was causal. 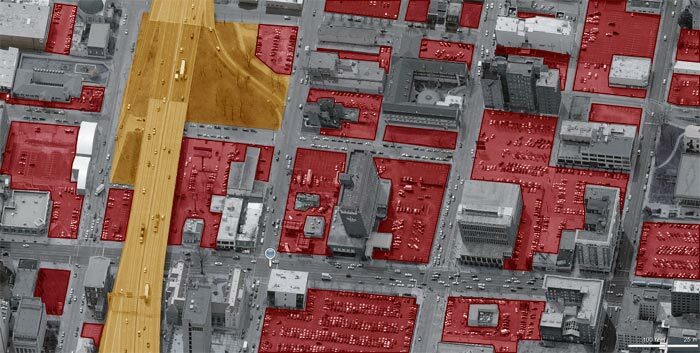 For example, data indicated that increases in parking tended to precede growth in car commuting. Researchers compared five cities with low car commuting rates (Arlington, Virginia; Berkeley, California; Silver Spring, Maryland; and Somerville and Cambridge, Massachusetts) to four cities with relatively high car commuting rates (Albany, New York; Lowell, Massachusetts; and New Haven and Hartford, Connecticut). McCahill and his team found that for every 10 percentage point increase in parking spaces per capita, the share of workers commuting by car would be expected to increase by 7.7 percentage points. So if a city increased its per capita parking from 0.1 spaces to 0.5 spaces, car commute mode share would rise about 30 percentage points. 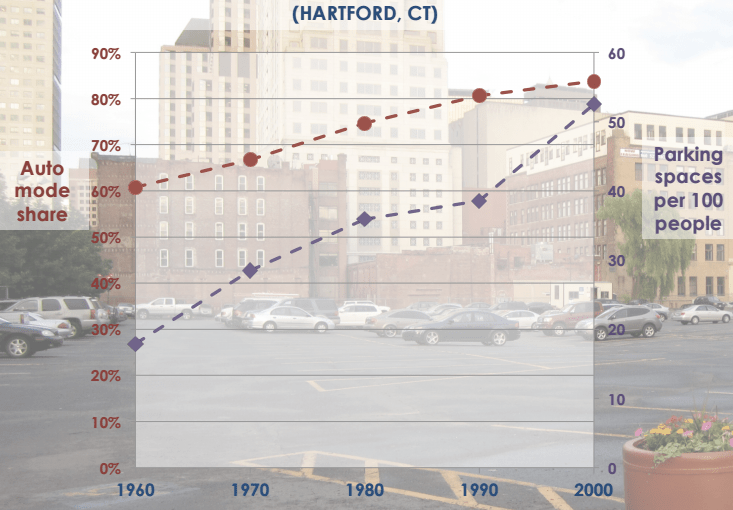 In Hartford, for instance, the number of parking spaces in the city increased from about 15,000 in 1960 to about 47,000 by 2000. The city’s solo car-commuting rate over that time rose more than 20 percentage points. University of Connecticut Professor Norman Garrick, who co-authored the study, said the findings indicate it’s not in the interest of cities to continue to add parking. 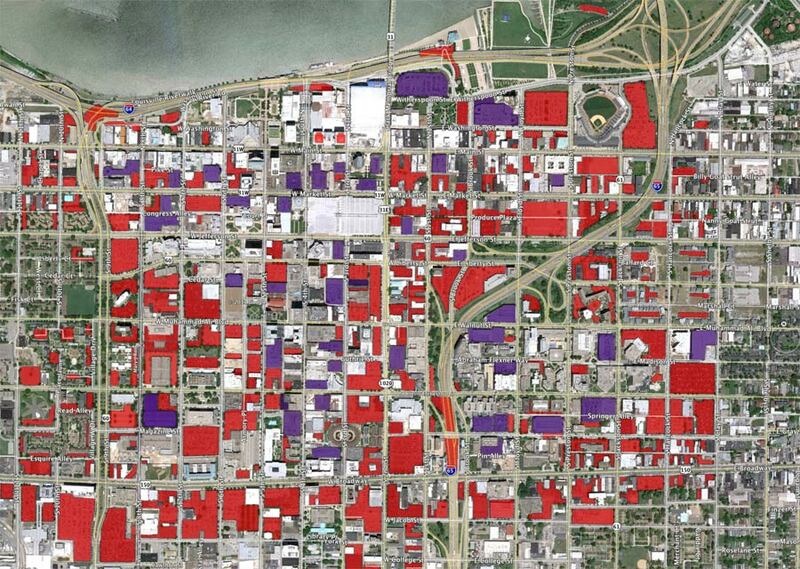 Meanwhile Downtown Louisville is a vast expanse of parking lots. What “City leaders” are thinking is that demolishing old buildings a paving the land entices developers to come along sometime and “develop”. What we need next in terms of research is something that either supports this theory or else debunks it.